First Time Mama - First Time Blogger: Big change from Christmas 2010 to 2011! Big change from Christmas 2010 to 2011! Sometimes you forget how much your child can really change in one year's time. I recall taking Julianna's Christmas pictures right around this time last year and when I look at the pictures, I can not believe it has been a whole year!! I can't believe how big she has gotten, and how much her features have changed. She still has that magical little smile - but what a big girl she has become! Come to think of it, I can't believe how much she has changed our lives, and continues to do so on a daily basis. I know it's cliche', but I don't remember life before her. It is such a reward to be a Mommy to this beautiful & happy little girl! Last year, at Christmas time, she was able to open some presents but she really did not know what was going on. We had to kind of prop her up against the presents so she wouldn't fall backwards! I think this year will be much more fun. She is very excited over the Christmas tree and the lights. My husband and I are really looking forward to Christmas this year with Julianna. We have been doing everything we can to make it fun already. We recorded a few classic shows like Rudolph, Frosty, and the Grinch. I hope she will sit and watch Rudolph with us this weekend! I can't wait to put her gifts under the tree from "Santa". We also plan on teaching her how we leave cookies for Santa and his reindeer on Christmas eve.... (Mommy & Daddy will be eating those when she goes to bed- Yummmm!) ... and I can't wait to make cookies even though she can't help with that. Maybe we can let her ice one of them and get it all over the place! haha! 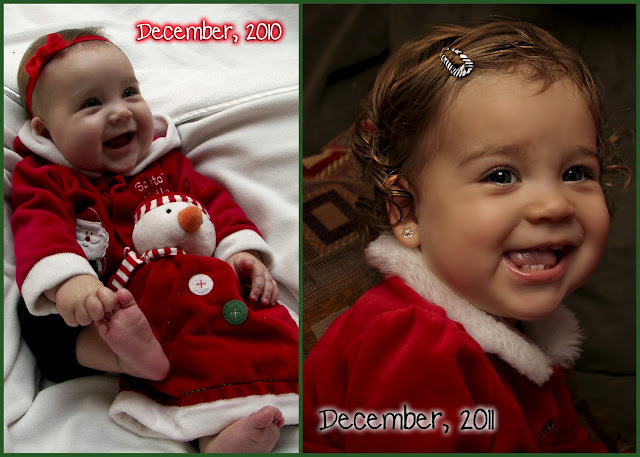 Here is my little girl's picture from last year and then from a few days ago... How she has grown! Oh my goodness she changed a lot! Still the cutest lil girl ever! She really is such a cute little girl. Thank you - she still seems like the same little beauty to me but she really has changed sooo much!! My Christmas Cards - I love Shutterfly!